Talk to M'boma in Coimbra. Move to Byron and talk to Beatrice to be moved to a non-combat instance. Talk to Taikbin and then to Beatrice. Talk to Pharrel to be moved to a non-combat instance. With M'boma as leader, talk to Beatrice to be moved to a non-combat instance. From here on out use M'boma as leader whenever you talk to anyone. Get 1x Nephtys Piece and 1x Cortes Piece from TimeParadox missions, then give them to Veatrice. The item droprate is 100% providing you are in the right squad like in Lionel's quest. Also as in the TimeParadox missions for Ion's card, these missions are very tough and may need a couple of tries even for experienced and tough players to finish. There is no other way to get these items for now. To easier ensure the questing party gets the item, the 2nd squad (if existing) should disband completely at around 10% of boss health. For questers, remember to bring a bunch of Soul Crystals to the raids since you have to be alive to get the quest item. Nephtys: Kill the monsters in the corridors, having tank go first to aggro. Then proceed to one Ararat-room, kill the mages and then Ararat. Do the same for the other Ararat-room. Once in the room with Nephtys, tank will kite her. She is VERY slow. Do note she has an Abyss Flare like attack, so when you see her fly up, run far away. She will also summon minions that stun you, and hit VERY hard. At times, she will summon them back to herself, which can save you from harm. Otherwise, if you aggroed minions, run out of her room to de-aggro. Cortes: This raid needs 1 tank, and a team of dedicated 3x WC/Eraser. Tank needs to obviously keep Cortes turned away from dps, while WCer stops Cortes from using Stone Sweep (it 1hko's pretty much everything). It may be easiest for the tanker to only have 1 character with him, having 3 can screw you over. Tank goes in first to aggro mobs, kill them as he does so. Once monsters are cleared, head up towards Cortes. Note that in the area around him, falling stones keep appearing. They can stun, petrify and knock you down. Debuffs can be removed with Refresh Mind. For DPS, position yourself behind Cortes back so his normal attack won't hit you. Keep your reser further away. 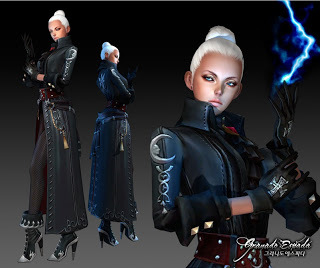 Eva Sharon will appear at a certain percentage of Cortes hp, focus her -- she casts Darkness debuffs. Remove these with Escape Artist. Talk to Beatrice. You will be moved to a non-combat instance. Talk to Veatrice to recieve her character card. Pre-requisite: Finish Beatrice's recruitment quest. Talk to Beatrice using M'boma. You will be moved to two non-combat instances. With Beatrice in your team, move to Rio Albi and click on the Gate of Lightning at e7 at channel 1. You will be moved to a quest instance and as such do not need the usual items that are otherwise required to enter. Talk to Einschwer using Veatrice to recieve the Tempest Stancebook. OPTIONAL WAY: Buy the stancebook from Master Guardian with 5 Stance Promotion Scrolls. » Need Jane the Rabbit! !